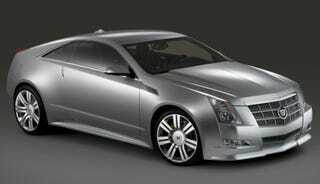 Following a teaser preview at Pebble Beach this past weekend, GM announced the Cadillac CTS Coupe would finally flaunt its doorless flanks for the public at this November's 2008 LA Auto Show. Reports, as well as spy photos and official pres shots we've already seen, indicate the coupe will arrive nearly unchanged from the concept that first bowed at this year's Detroit Auto Show, featuring CTS sedan styling forward of the A-pillar but unique, more-aggressive sheetmetal from that point back. With a center-exit exhaust and a steeply raked rear window, the CTS Coupe is going to be a whole new interpretation of Caddy's design language, and we can't wait to see it at the show.